One of the best ways to brighten up the holiday season is to attend one of the best holiday light shows in Las Vegas or Henderson. Las Vegas is a city of lights every day of the year, but residents pull out all the stops when it comes to celebrating the winter holidays. Glittering Lights at Las Vegas Motor Speedway will make you wonder exactly how long it takes to string up over three million holiday lights? The people at Las Vegas Motor Speedway do this every year along a 2.5-mile length of the road. The track is situated on Las Vegas Boulevard North and is a short drive from most of Las Vegas that is open from November 9th through January 6th. Ethel M Cactus Garden in Henderson creates an enchanting experience for people of all ages. There’s just something so magical about seeing the colorful lights that makes your heart a bit lighter. Magical Forest at Opportunity Villages is a Christmas wonderland that is filled with endless entertainment and cheer, ensuring you celebrate the holiday season in style. Immerse yourself in the festive fun by strolling the grounds and watching the dazzling light displays. House On Robindale is where the holiday spirit is set in motion, where the owner, Marc Savard and his family go all out to celebrate with their own amazing lights event. The enchanting music is synchronized to the spectacular Christmas light show. The 85,000 twinkling lights on the home fit the theme of the music, and you can watch from the comfort of your car while listening to a local radio station playing holiday tunes. The simple yet incredible Christmas light spectacular display has caught the public’s attention in the past years and is a favorite for many. Bellagio Conservatory and Botanical Gardens features an indoor Christmas light display. They feature a giant holiday tree that is brilliantly lit with 7,000 white LED lights and 2,500 ornaments. The Lori Ballen Team wishes you a safe and joy filled holiday season that is full of laughter and many magical adventures. 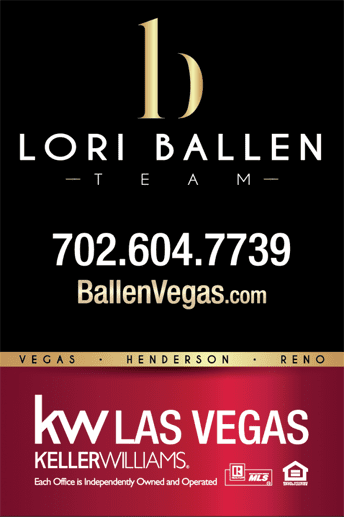 Remember us for all your real estate needs. Give us a call at 702-604-7739.